The Eco Warrior Team with their ‘Green Flag’ award. 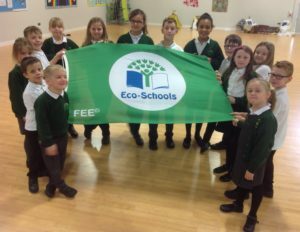 FOREST and Sandridge School has been awarded an ‘Eco-Schools Green Flag,’ an internationally recognised award, for their excellence in environmental action and learning. Deputy head at Forest and Sandridge School, Helen Biles-Wood said, “An assessor came to school to interview our team of eco warriors along with coordinator Mrs Bacon and governor Mr Lawrence. “The eco warriors were a credit to our school, explaining and showing how we have improved our environmental awareness and school environment over the last few years. “The assessor commented that ‘Forest and Sandridge School is an excellent example of a school achieving their first Green Flag. The eco warriors should be extremely proud of the project work they have carried out on their chosen topics, in particular, their imaginative ‘Caught on Camera’ to promote the reduction of waste and littering within the school grounds. “We are very lucky to have such a committed group of children, as well as Mrs Bacon who leads our eco warriors with passion and enthusiasm.